The town of Siem Reap in northern Cambodia is the primary gateway for the Angkor Archaeological Park. French colonial architecture still dominates the streetscape. Khmer wooden houses are still preserved around town and in the countryside, but the number is decreasing. The name Siem Reap literally means "Siam Defeated". These days, however, the only rampaging hordes are the tourists heading to the Angkor Archaeological Park. This once quaint village has become the largest boom town and construction site in Cambodia. It's quite laid-back and a pleasant place to stay while touring the temples and a nice compromise between observing Cambodian life and enjoying the amenities of modern services and entertainment, thanks to a large expatriate community. Be sure to pick up your free Siem Reap Angkor Visitors Guide and the equally free and useful Siem Reap Pocket Guide from your hotel/guesthouse. It contains lots of info on Siem Reap and the Angkor Archaeological Park, including hotel/bar/restaurant/shop info, travel info, and maps. For the eco-sensitive tourist, check out "Stay Another Day: Cambodia," a detailed guide with local spots that support the environment and community. Another address is the ConCERT tourist office, a local NGO committed to raising the standards of responsible tourism and ecotourism activities and providing information on the causes and effects of poverty in Cambodia, volunteering opportunities and ecotours. APSARA (the acronym is based on the French for the "Authority for the Protection and Management of Angkor and the Region of Siem Reap" and also the Sanskrit for a female spirit of the clouds and waters in Hindu and Buddhist mythology) has a very informative website detailing the history and architecture (in 6 languages) and endorsed by the recently deceased King of Cambodia. The International departure tax of US$25 fee is included in the ticket price. The $6 Domestic departure tax fee is also included in the ticket price. Siem Reap International Airport (IATA: REP, ICAO: VDSR) is the second largest airport in Cambodia. Its modern architecture is based on the traditional Khmer style. Its facilities are limited. There are separate terminals for international and domestic flights. You can obtain a visa on arrival at the airport. Bring US dollars to pay for it, as proffering other currencies will result in a large "conversion fee". Bring a passport-sized photo also. Immigration and Customs staff are possibly the unfriendliest Cambodians you will meet on your trip: grin and bear it, as entry procedures don't take long. You may be asked for a "tip" by Immigration staff. Politely decline: you will be allowed in regardless. Fingerprinting is now in operation at the airport for International visitors arriving from outside of Cambodia. During festive seasons such as Chinese New Year, immigration officers may demand for 'red packet' money when they stamp your passport. This may be meant as a joke and they may point to a pile of USD on their counter. However, politely decline and do not give in. The airport is around 7 km from the town centre. Prepaid taxis cost US$12, see the prepaid booth just outside the terminal. Prepaid tuktuk rides are also available for $9. Thrill seeking solo travellers without much baggage can save a few dollars by opting for back of a motodop for US$5. Most hotels offer a free airport pick-up if you've booked in advance. Major companies include Phnom Penh Sorya Transport, Capitol Tours, Giant Ibis and GST Express. Mekong Express comes highly recommended for its safety record and because the staff checks your ticket before giving you your luggage back (preventing theft). Beware of "direct" buses from Bangkok to Siem Reap. They are part of a multi-stage scam, where visitors are tricked into paying extra for the visa, and exchanging their money at a poor rate. They contain many delays, making the trip last for as much as fifteen hours. If you find yourself in one of these scams, cut your losses and find your own way throught the border and Siem Reap via minibus. The shuttle bus from right after the border, and even the bus station it leads to, is all a part of the scam. Part of the scam is the stop before the border at a restaurant, where they bring people to an office individually, asking for 1600 THB to process the Cambodian tourist visa. Be assertive and tell them you will get it yourself at the border. They won't be happy, but will take you early ahead of the others. Visa was $30 USD, plus 100 THB if you don't have 2 passport photos. Very painless, only took us an extra 10-15 minutes. However, a new company "NATTAKAN (Cambodia) CO., LTD" started operating a direct bus from Siem Reap to Bangkok for $28 including pick up from the hotel. You still need to get off the bus at the border, go through customs and get the visa but it is a lot smoother and scam-free as compared to the options in the past, you ride the same bus from Siem Reap to Bangkok. The bus departs from their office along Sivatha Road near KFC restaurant where tickets can be purchased. Try to book at least the day before travel. Travel agents and guest houses will do this for a US$1-2 fee. Buses tend to leave in the morning or early afternoon. There are also night buses on some routes. Now tickets can also be purchased online via direct websites of some of the bus companies and also from BookMeBus and CamboTicket.com, online bus ticketing portals. Payment can be made securely via credit/debit cards (MasterCard/Visa), WING money transfer and also Cash on delivery (within Phnom Penh). Most buses terminate at an out of town bus station to the east of Siem Reap, from where tuk-tuks are needed to get into the town. Mekong Express also drops you at an out of town bus depot but, if there are local Cambodians on your bus, they will provide a shuttle bus into town which drops you direct at your hotel and only costs $1. They will try to dissuade foreigners from using this by saying the bus ticket is $5. However, it is only $1. A tuk tuk into town costs about $3 to $4. If arriving from the west, your bus will probably by-pass Siem Reap and still drop you off at the bus station to the east of town. Sihanoukville Direct Sleeper Bus (be aware of scam about Hotel Bus for US16$ as people said they not only weren't with WiFi and toilet, but with changes of bus from sleeper to regular seats). Should cost US13$ with free pickup from hostel/guesthouse. Be wary of the sleeper bus from Siem Reap to Vientiane. A second payment may be sought for travel onward after stopping for the border crossing. Unscheduled trip delays and an unexpected change to a different service may occur en-route. Be alert to issues of personal security and be watchful concerning your possessions and luggage, especially whilst sleeping. From Bangkok: Agents in Kao San Road offer tickets to Siem Reap from 300 THB. These are often part of a scam, and the journey can take more than twelve hours. To/from Bangkok there is a direct bus run by Nattakarn Bus Company that leaves Mo Chit bus station at 8am. You do not change buses in Poipet, but must alight to go through border formalities. The cost is around 900฿ ($28) Arrival and departures in Siem Reap are from outside KFC on Sivatha Rd, where the company maintains an office. If travelling independently to the Aranyaprathet/Poipet border, see those towns' articles for advice on how to reach the border, survive immigration and avoid the "Government" bus scam. A more expensive and more time consuming option from Phnom Penh ($35, 6 hr) or Battambang (US$20-25, 5 hr) is to take a Soviet style Hydrofoil across the Tonle Sap lake. These can be fantastic trips giving you the opportunity to view life on the lake, floating houses, working fishermen, and to get a sun-tan if you choose to sit on the roof of the boat. However, the trip can be ruined due to bad weather. Remember to use sunscreen and take a waterproof jacket. You will not be always able to access your luggage during the journey (sometimes the baggage is available, sometimes it is not). If you have the time, it is better to visit the floating villages as day trips from Siem Reap than to see them from the boat. There is a railway line from Phnom Penh to Poipet (Sisophon being the nearest station to Siem Reap), but no trains currently run in Cambodia. The train to AranyaPrathet from Bangkok leaves twice a day and costs only 48฿ in 3rd class. As of April 2014, Thai citizens travel free which means the train is often crowded and sometimes late. Once again, be aware of promised direct bus because some of them stop in Phnom Phen in the middle of the night where you have to change for another one. The quickest method of getting from the Poipet border to Siem Reap is a shared car. A four seater car costs US$25-45, depending on your bargaining prowess, and takes 2-3 hr. Even if you're travelling solo, it shouldn't be too hard to find others to share the expense. Helicopters can be chartered to go nearly anywhere in the country. They seat 5-6 people. Prices start at US$1,000 for trips to some of the temples north of Angkor Wat. Companies include Helicopters Cambodia and Helistar Cambodia. Travel to and around the Angkor Archaeological Park is extensively covered in its own article. The following is a discussion of travel within Siem Reap. 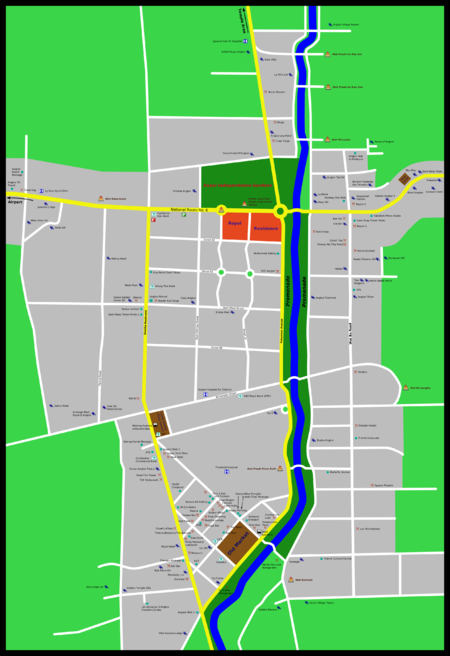 The city centre is fairly compact and flat. Many guest houses will lend you bicycles either for free or cheaply (US$1-3). Mountain bikes start from US3$ (you need to look for a couple of renting shops before finding this price as many charge far more). Motodops (motorbike taxi) abound and will make sure you know where they are. Rides within town should only cost US$0.50 or 2,000 riel, although prices can double at night or during bad weather. Agree a price first. Full day can be arranged for ~US$10. Helmets for passengers are rare though may materialize if requested in advance. Renting a motorbike was prohibited for foreign visitors to Siem Reap until recently, however since 2016 only few shops started renting them again (US$10). Motorbikes rented elsewhere are permitted, naturally (if you rent in Phnom Penh, you can even get the deal of US$3 per day). Petrol stations vary from first world forecourts to roadside stalls selling fuel of dubious quality in old drinks bottles. Tuk-tuks, like motodops, will call to tourists from nearly any street corner. On your first few days, they will continually pester you to use them but after that they will recognise you and generally leave you alone. A trip within Siem Reap should cost US$1 regardless of how many people pile on, though some drivers may test your gullibility for $2. Most tuk-tuks can convey four people comfortably though the extra weight can make the low-powered bikes laboriously slow. Ensure both you and the driver are in crystal clear agreement on the destination and total fare before departure. Payment is made on arrival and doesn't increase if the driver got lost or had to take a circuitous route. Many drivers are honest though a few do try to overcharge. Short trips; try to pay with $1 bills or a $5 bill. They rarely have change for anything larger. It is recommended to have a business card of your hotel / destination written in Khmer language as many drivers are lost with English street names. They work for little money so will appreciate any tip. Cars with drivers can be hired for single or multiple days. While all drivers are familiar with the area and happy to suggest good routes, most speak little English and are not actual tour guides. Licensed tour guides mosly in English charge US$40-US$50 per day and for English speaking driver with car charges $ 35 to $ 40 a day inner Angkor area . Drivers will likely ask for US$5-US$10 to $ 30 extra for trips to further temples such as the those of the Big Circuit, Banteay Srey and more for remote sites like Beng Mealea. The taxis (US$9 fixed cost) from the airport to Siem Reap proper may provide a full day of touring for US$25-30. If you need to take the taxi around the grand circle tour, it will be costed 40$ and to Banteay Stei Temple is 50$. Beware of airport taxi drivers talking you into a tour, as they tend to charge you a much higher price. Do not assume that the official counter at the airport makes them better as the quality of drivers varies a lot. Only book a driver and a car through your hotel to avoid scam. PassApp and Grab are good alternative to book your car or tuk tuk with fair price. Local number is required for registration. Wat Preah Enkosa - average little temple. Wat Preah Enkosei - interesting little temple, painted orange. Wat Po Lanka - little temple painted white. Wat Bo - two large brand new temples and one old white one. The new ones, almost finished, have been under construction since 2011. Wat Damnak located behind the market on the south-eastern side of the river. Also houses the Center for Khmer Studies, a library and a primary school. Wat Kesararam located in central Siem Reap on National Road 6 towards the Airport, adjacent to Sokha Angkor Resort. The temple is known for its beautiful ceiling and wall murals. Bambu Stage, Bamboo Street, Wat Damnark, Siem Reap (Open-air performance space set amid the lush and intimate garden of the former Tangram Garden), ☎ +855 97726 1110 ([email protected]), . Bambu Stage has two big green growing shoots. 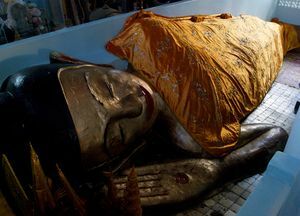 The first is to change perceptions about the history, cultures and issues that affect Cambodia. Having worked in museums and theatre all their lives gives them insight about people and how they really enjoy an authentic experience- something that comes from the heart of a culture. Something that lets those shoot grow with abundance. Bambu Stage is one of Siem Reap's unique artistic venue presenting unique contemporary performances by young Cambodian artists. A new generation of independent and incredible performers with classical backgrounds but professionally trained in modern dance. Their style is very now, but firmly rooted in Cambodian tradition. The Khmers believe that Thai massage is derived from Khmer massage but is more relaxing as it requires less twisting and turning. The numerous Khmer style massage shops are mostly (and this means "mostly" as oil massages may lead their hands to wander...) genuine massage and not a front for sexual services. If you feel unsure what type they will give you, a safe bet is to opt for one of the blind massage services. The trained masseurs are the real deal. Some are inside the night market. Some visitors naively think visiting an orphanage may help children in Cambodia, but most orphanage tours do more harm than good. Visit www.thinkchildsafe.org  to get informed before visiting. The largest child protection group in the country has asked that tourists not visit orphanages--the great majority of Cambodian children in orphanages have living parents, but the tourist demand for orphans results in these children being separated from their parents. Orphanages and the aid organizations that support them are a significant feature of the Siem Reap economy. Many are scams, so it's worth doing a bit of research on them beforehand. As elsewhere in Cambodia, US Dollars, is preferred, along with Cambodian Riel. Using Riel for small purchases can be better than using dollars as retailers tend to round up US$ prices. The Heritage Watch  non-profit organisation supports business that promote Cambodia's arts, culture, heritage and development. 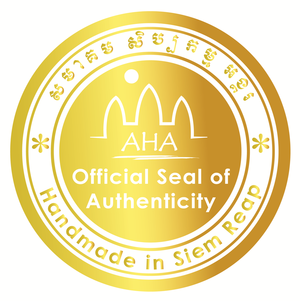 Certified businesses display either a gold or silver Heritage Friendly logo. 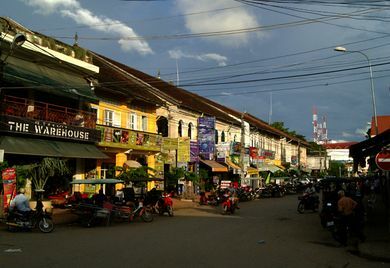 Alley West is one of the most beautiful streets in Siem Reap, if not the most. You will find art galleries, restaurants, ice cream, fine shops, a hotel, hair dresser, and bars. The easiest-to-access markets are in the centre of town in the streets coming off the main intersection. (Pub Street is one of its streets.) Generally, the further you get from that intersection, the better the goods, and the less you will be hassled by touts selling girls, drugs, etc. Go down little alleys! These also take you away from the deafening noise in the centre of town. Eating options span the full spectrum of tastes and budgets from the rudimentary Asian staples and pizza to authentic Khmer and sophisticated fine-dining featuring exotic local ingredients. The largest assortment of restaurants are a few blocks north of the Old Market but there are numerous appetizing alternatives along Wat Bo Road and hidden among the surrounding neighbourhoods. For Muslim travelers, there is also a halal pizza restaurant in the vicinity of Public Bank. The food is delicious and the prices reasonable. There are plenty of vegan and vegetarian option in Siem Reap including Cambodian places like Chamkar and also fusion places like Moringa Bar or Artillery Cafe. Though Pub St is better known for its bars a handful of places are known for great food, many with seating upstairs so you can escape above the partying milieu on the street below. Crammed along The Alley is a wider selection of restaurants that offer a generally quieter and more intimate experience. The local restaurants lining Phsar Chas have extensive yet near identical menus of cheap fried rice and westernised approximations of Khmer dishes. At dusk the Kindergarten on the corner of Street 8 and 11 erupts into a a rabble of small BBQ stalls, billowing smoke, noise and the persistently entreating peddlers. Sok San Road is directly across Sivatha Blvd from Pub Street. Restaurants, hotels and massage parlors line the street. The second block of Sok San Road has been developed more recently and has many new establishments. The distinction between eating and drinking establishments is fairly blurry as even the most humble of restaurants can have an extensive cocktail list on their menu. Nonetheless, a vibrant drinking scene concentrated along Street 8, aptly dubbed Pub St, is where serious drinkers head for cheap beer, loud music and the sweaty backpacking hubbub scene which some consider to be akin to Bangkok's Khao San Road. The reality is that it is much more relaxed and attracts wider age range and socio economic group than KSR. The biggest and most well known Pub St bars, Angkor What?, The Red Piano, Temple club and Le Tigre de Papier, are easy to find. Street entertainers in the evenings add to the fun. Visitors looking for more subdued place to appreciate a quiet drink can seek out some of the smaller places along The Alley, The Lane and the adjoining streets. Steung Thmei Road is a quiet and lesser-known street directly behind Sok San Road where the bars have a more chilled out vibe and don't have to compete with each other's music systems. This can be a welcome break from the deafening throb of pub street. Most places have draft Angkor beer for US$0.50 and cans of other beers for US$1-2. Higher-quality, smaller-batch craft beer is now up and coming in Cambodia and offered at a few places in town, such as Moringa Bar or the Siem Reap Brew Pub. Cocktails and spirits go for as little as US$2. Imported red and white wine, generally from the less prestigious wine producing countries, is widely available and cheaper than you would expect. Better quality Australian and French wines are available in more upmarket establishments at a correspondingly premium price. Bubble tea, also referred to as Boba tea, and real fruit smoothies are non-alcoholic options. Chillax Lounge & Bar, Artisan Angkor Street (Opposite Golden Temple Villa Guest House), ☎ 078 710 225 ([email protected]), . 5pm -2am Sunday closed. Chillax Lounge – a designer choice bar – serving excellent signature cocktails, cold drinks and playing cool tunes every day from 5pm – 2 am except Sundays. Gayfriendly $4 Signature Cocktails and cold drinks. edit. A seemingly inexhaustible range of sleeping options from upmarket hotels to grubby backpacker hostels, with a myriad of guest houses, boutique rooms, bungalows, concrete cells, wood huts and French villas in between, make finding a place to sleep one of the easiest things you will do on your trip. Hotels are spread over the entire city but most larger hotels line the National Highway to the Airport, cheap backpacker hostels tend to surround the old market area and stylish boutique hotels are nestled in the trees along Wat Bo Road. Small Khmer run hotels and guest houses, especially in the low season, can be surprisingly good value if you are willing to do a bit of hunting for one that hasn't been overrun by the guidebook toting hoards. Accommodations at every price point generally offer hot water showers, cable TV, internet and airport or bus pickup. Some may include free breakfast, though don't expect much more than an egg on toast and a coffee. Most hostels are can be booked through Agoda, Hostelworld, Hostelbookers, Booking.com, etc but some of their cheaper rooms are not advertised online. Best to walk in and ask. Tanei Guesthouse Siem Reap, (next to Artisan D’Angkor), . Free in room WiFi 24 hr, free tea & coffee, swimming pool, jacuzzi, restaurant, lobby, quiet garden, terrace, fresh atmosphere, mini-bar, friendly staff, English speaking staff, cleaning room, in room refrigerator, electric lamp, slippers, alarm clock, traditional Khmer pictures, fan, air-con, hot water, cableTV, window, 24 hr services and 24 hr security. Room rates from US$12 include free pick-up. Casa Angkor Hotel, 52 Oum Chhay St. ☎ +855 63 966 234, . Colonial Architecture Hotel. Great location in Siem Reap’s Old French Quarter. It offers an outdoor pool, dining options, spa and free Wi-Fi. From US$40 with buffet breakfast included. Central Boutique Angkor Hotel, . Locally owned and operated. Clean, comfortable hotel, not too far from the centre of town, with western bathrooms, gardens and a pool. air-con rooms from US$29 with breakfast included. City River Hotel, Steung Siem Reap St. ☎ +855 63 763 000, . Comfortable hotel near the city centre. Airport pick-up. Internet access in rooms and accepts credit cards. From US$60. Claremont Angkor Boutique Hotel, No.0017, Phum Wat Bo, Sala Kamreuork, Siem Reap ☎ +855 63 966 898, . Offers spacious rooms and deluxe amenities. The hotel is located in central Siem Reap City near the airport and close to Pub Street, Psar Chas Market, and Angkor National Museum. Serves complimentary daily breakfast, with swimming pool, fitness facility, spa and body treatments. From US$35. Golden Temple Hotel, 7 Makara Rd. ☎ +855 12 756 655, . Excellent Khmer-style quality for an affordable price, rooms starting at US$55. 5 min walk to the centre of Siem Reap. Pool, massage services. Staff can organise trios to Angkor Wat or elsewhere close by. 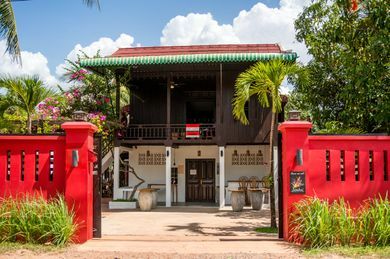 Kanitha Boutique Villa, Phum Krous, Khum Svaydongkom, Siem Reap . The hotel offers first-class accommodation in its Villas and Deluxe Rooms. Rooms are spacious furnished with luxury amenities, high-speed internet connection and complete hotel facilities. There is a swimming pool, cafe by the pool, bar and restaurant, travel desk and a tropical garden setting. Men's Resort & Spa, ☎ +855 63 963 503, . Located in the heart of Siem Reap. "male exclusive" gay hotel. The complex includes a boutique hotel with 10 stylish rooms, a large pool, a fitness centre, massage service and sauna/spa. Rooms from US$49. Mom´s Guest House, 99, Wat Bo Street, Siem Reap. ☎ +855 12 630170, . Centrally located, it is one of the few best family-run guesthouses currently operational in Siem Reap. Short walk to the Old Market and Pub Street. 10 minutes drive to the temples. Free breakfast, swimming pool, wifi and free pick up from the airport. Rooms from US$25. My Hibiscus Hotels and Resort, Taneuy Street, Wat Bo Village, Sangkat Salakamreuk, . The hotel offers deluxe accommodation in its airconditioned hotel rooms and two outdoor swimming pools. It is located 5 minutes drive from Pub Street and the Old Market. Ta Phrom Hotel, (river front, next to Old Market), Pokambor Avenue, Mondul I, Sangkat Svay Dangkum, ☎ Resv +855 63 380 117, +855 63 760 087, Fax: +855 63 963 528, . Free in room WiFi 24 hr, restaurant, wooden rounded stairs lobby, wooden interior and beautiful statues, terrace, traditional atmosphere with French colonial exterior, friendly staff, English speaking staff, cleaning room, in room refrigerator, mini-bar, slippers, air-con, hot water and bathtub, cableTV, 24 hr services and 24 hr security. Room rates US$35-80. A hotel with strategic location within walking distances to Old Market, Pub Street and Night Markets. Siem Reap Art Centre Market is just across the river. Lovely hotel with exceptional wooden interior, breakfast are included and free airport pick-up for longer stay. The Cockatoo Nature Resort, ☎ +855 63 969 069, . 7 rooms in a restored traditional Khmer house plus 2 Balinese-inspired grass-roofed cottages. Pool and lush gardens. Gourmet food served at main restaurant or poolside bar. From US$35 during low season (May-Sept). Best to reserve on hotel's own website; enquire for current promotional offers. The Pool and Palm villa, ☎ +855 77 359 677, . Located near Build Bright University (BBU). The resort includes two villa's: Khmer-French style and modern with stylish rooms, a 17 metre long infinity pool, 8,500 square metre garden, restaurant. Rooms from US$ 38,- (low season) to US$100,- (family room with living room high season). The RiverGarden Siem Reap, 113 Mondule 3, ☎ +855 63 963 400, . Standard rooms start at US$35, superior from US$45, deluxe from US$65, Khmer Cottage from US$45. Villa Siem Reap, 153 Taphul Rd, ☎ +855 63 761 036, . Several min walk to shopping, restaurants and the old market. Runs excellent excursions to temples and floating village. Standard rooms from US$18, superior from US$25, deluxe from US$30, villa bungalows from US$45. Siem Reap has long since been thoroughly de-mined. Most locals are decent people just trying to make an honest living but a few shady characters try every trick to take advantage of visitors. Be alert to deception, but don't let suspicion ruin your visit. Airport arrival scams: (i) Charging you a huge "conversion fee" at the Immigration desk, to convert your currency into USD: so bring USD; (ii) Being asked for a "tip" by the Immigration staffer, as he holds your passport in his hand. Politely decline: he'll return your passport anyway. (iii) Bring small change (1s, 5s, and 10s) for the visa payment, as the change balance may not be returned to you by airport staff, and they might deny having ever received from you an amount greater than the price of the visa. Insistence that you are owed change will not help. Street vendors and beggars in competition for generous visitors' handouts have developed cunning, if underhanded, techniques to get your attention and money. The "beggar army" of young children will come up to you in the crowd and grab your hands, leading you to a store where they will then try and have you buy food/baby milk/water for them: baby milk seems the most popular. It might sound like a more humanitarian way to help than simply giving them money, but once you leave the shop the goods you bought for them are sold back to the owners, or to other locals and the cash goes to an adult. Young women with babies cradled in a krama perform a similar trick. Donation-collectors for orphanages may approach you in the street claiming to be volunteer workers, showing you convincing photos of themselves in the orphanage and a clip board listing the generous donations made by foreign visitors. Though these young adults may be well groomed and speak excellent English it's possible that your donation will go directly into their pockets. A donation of money or your time to a recognised charity might be a better way to help. Baby-milk scams may be encountered in the centre of town, outside supermarkets. A very poor looking woman will beg for some milk powder, pointing to her baby. If one cracks and buys the milk, she later returns it to the shop, and the money is split 50:50. VIP sleeper night bus scam encountered Jan 2013. Travel agencies sell expensive tickets to Phnom Pehn ($10 against $6) in VIP sleeper beds buses operated by transport companies “Golden VIP Transport Service” and “Virak-Buntham Express Tour&Travel”. Buses leave at midnight. When Pick-up brings you to the bus, it can so happen, that you find instead of sleeper bus the regular bus with seats instead beds and if you are not lucky you become the seats in the back that no lean back and have to sit upright all the night. This scam still actual on May 2015 by transport company OTM (Olympic Transport Co.) and others with the tickets to Sihanoukville. Company says that the road takes only 9h and that there's no bus change in Phnom Penh. In reality it's 14h road with changing the bus to usual (not Hotel Bus or Sleeping Bus which you paid for), so you have to sit rest of the journey. Mentioned, that there's no correlation on the price, as people paid for their tickets from $13 to $17 to get from Siem Reap to Sihanoukville with the Sleeping Bus. Tuk Tuks off the airport When getting off the airport, you may be offered to get a ride from a Tuk Tuk driver to your hotel, which are the same ones ordered right off the airport counters. Later when dropping you off, he may offer to be your local guide for the duration of your stay, and the price he may offer may seem too good to be true. It usually is and when you find out at the end that he's not sticking to his side of the deal, things do get awkward. Consider the fact that if you buy into the scam, you maybe helping him and his family out, especially during the desperate low season, this can turn into a personal choice. The taxi service at the airport "Tourist Transport Association" also has the same problem. Do not buy into any tour offers by drivers of the company as they tend to be low quality and always try to rip you off. They also pretend to be tour guide but in fact they are only drivers and are not licensed. Just keep this in mind, and be more open to the drivers/guides options available at your hotel or hostel, who tell fewer lies and the prices tend to be reasonable. You can verify your guide's name and license number online. Fake Tuk Tuk destination scam The rare unscrupulous tuktuk driver may take you to a destination other than what you specify, such as a different tourist attraction, which is in some way related to what you are looking for.They may have some connection or get some kickback from this attraction. Before debarking, be sure you are at the right place, and if not, insist that they take you where you are supposed to be. Massage scam After agreeing upon the price and bringing you to a massage room, more girls (2 or more) enter and start doing massage together. After finishing, they demand the agreed payment for every girl. Even if you understand that it's a scam before the massage started - they are extremely obstinate and can go as far as to not let you leave by using physical force. An overarching problem that may stoke some scams is an increase in the use of meth or 'yabba'. Locals blame Filipino musicians with ties to the local bar scene and music scene. Stick with happy pizzas. For general information on health, see our Cambodia#Stay_healthy article. The numerous Internet cafés charge anywhere US$0.50-1.50/hr. Speed of connection, and speed of PC, very much depends from place to place. A free public WiFi network covers the Pub St and Alley areas but it can sometimes be spotty and always terribly slow. Hello Internet Cafe, Sivatha St (in front of Acleda Bank), ☎ +855 17 889030, ([email protected]). High speed internet. Low overseas call rate. Internet US$0.5/hr, and overseas call US$0.10/min. E-Café, on Sivatha St, (north of Psar Chas), . A cut above the rest in connection and service quality, as well as price. Most hotels will have cable TV with many international channels such as BBC and CNN as well as those from surrounding countries. There are several FM radio stations, which includes Radio France International on 92.0MHz. Full service laundries can be found throughout town and most hotels and guesthouse will also take care of your laundry. The going rate is $1/kg. You may occasionally be able get it cheaper if you are willing to wait longer, in which case the laundries won't have to use the dryer. 3-hour services are frequently advertised, but rarely realistic. If you are travelling alone and want to go to the faraway temples (eg. Banteay Srei, Kbal Spean, Koh Ker, Phnom Kulen) it is cheaper to join a tour than hiring a motorbike (motodup) or tuktuk. Capitol Tours (Opposite National Bank Of Cambodia) has tours for a reasonable price (prices do not include ticket to enter the temples). Koh Ker - The ancient capital. Banteay Chhmar - the forgotten Angkorian complex in neighbouring Banteay Meanchey Province. A bit ambitous for a day trip by tuk-tuk but makes for a wonderful excursion by helicopter (about US$2,200). Phnom Bok. The highest hill in the area. Temple ruins - similar to those found atop of Phnom Krom and Phnom Bakong - can also be found on top of Phnom Bok. It lies 20km to the north east of Siem Reap. Expect a tiring hike up the stairs. A guard may be able to show you around. Don't forget to check out the old howitzers from the civil war. Admission is free, no pass is needed for the Angkorian ruins. Battambang. You can go from Siem Reap to Battambang by boat, on the lake then along the river. It can be a difficult trip in the dry season, as low water levels make it difficult for the boat to get to its destinations. You go past many many floating villages, saving you the Floating Village Tours (tourist trap alert!). One of the cheapest places to book the boat is at Angkor Pich Erich service, halfway Taphul street (012-270608). Phnom Penh. Cambodia's capital city offers a lively nightlife and excellent restaurant options. The trip from Siem Reap to Phnom Penh takes between 4.5 and 8 hours, depending on which form of transport you choose - there are lots of options.